From left: Ursula Owusu-Ekuful, Yolanda Cuba and Patricia Obo-Nai. 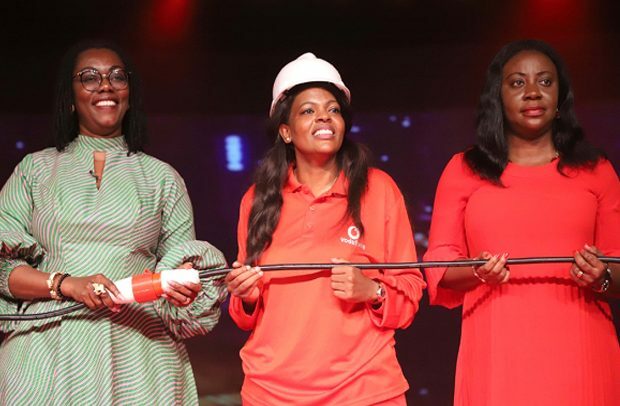 Vodafone Ghana yesterday launched the much-anticipated 4G long-term evolution (LTE) service in Accra to give customers of the telecoms giant a new experience of fast, reliant and seamless data services. According to Dr Kobina Quansah, Vodafone Ghana Board Chairman, the launch marks a new beginning for all customers of Vodafone Ghana and prospective ones. Yolanda Cuba, outgoing CEO of Vodafone Ghana, in a welcome address, said the road to the launch has been tough especially since it required even tougher decisions by management and shareholders. “ So the great news we are celebrating today is in order. Add the fact that management has also been able to forge an agreement between the shareholders of our company to give Vodafone a fresh lease of life through a balance sheet restructuring, and this celebration will be complete! This is because the balance sheet restructuring has been outstanding for a number of years. She added that the 4G deployment remained one of Vodafone’s biggest investments since it began operations in Ghana. Adding that 4G was great, she said she saw it as a step towards deploying 5G by the industry. Ghana’s data penetration stands at 80.3% and growing, close to 100% mobile phone penetration, among others. Patricia Obo-Nai is the incoming CEO of Vodafone Ghana.